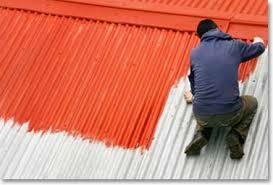 Maintaining your Orange County roofing in good condition is not difficult. Since Orange County has more sunny days than other places and less than average rainfall compared to national figures, corrosion may not be as prevalent compared to wetter and colder places in the US. But when the time comes that you need to repaint your roof, we compiled these reference-type guides to safely help your painting job. 1. Put your ladder on solid footing. If it stands on the grass, dig holes at the bottom for more stability. If it stands on solid ground, place a board or other materials behind the legs to support them and prevent slippage. 2. Make sure the worksite is clean and free from clutters that could pose serious hazard. These include nails and other sharp objects lying on the floor, which could injure you if you happen to step on them. 3. If working on steeped portions of the roof, always wear a safety harness to prevent falling to the ground if you slip. 4. Carry one material at a time when climbing up the ladder. Hauling more than what is necessary is dangerous. 5. Equip yourself with the proper work clothes and accessories such as safety goggles and roofing shoes while working on the roof. 6. Do not work alone on the roof. Always have somebody with you at all times in case of accidents and during times when outside help is necessary. 7. Wooden or fiberglass ladders are preferred when working on the roof instead of metal ladders, which conduct electricity. 8. Use ladder stabilizer to attach the top of the ladder to the roof. This will prevent unfortunate accidents associated with the improper use of a ladder. 9. Never walk on the roof when it is slippery. Remember that falls due to accidental slipping is one of the most common causes of roof-related injuries. 10. Check the weather before working on the roof. If the probability of rain is high, call off your work to another day. The same goes for windy days. These are not the best times to do roofing work. 11. Concentrate on your job. Some people get distracted by the view while working on the roof. A momentary lapse of focus could lead to injuries. 12. Know your limitations. If you are not comfortable with working on high places, hiring a professional is the better alternative rather than risking your safety doing something you are not skilled with. 13. Do not work on the roof under extremely hot or cold weather. Shingles and other roofing materials could get damaged under extreme weather condition and prevent proper application of paint. 14. Be careful when working around power lines because they are extremely dangerous. Call the power utility company before working to ensure safety. 15. Do not forget to apply the right type of primer for your roof. Paints will not properly adhere to the surface if you used the wrong primer.